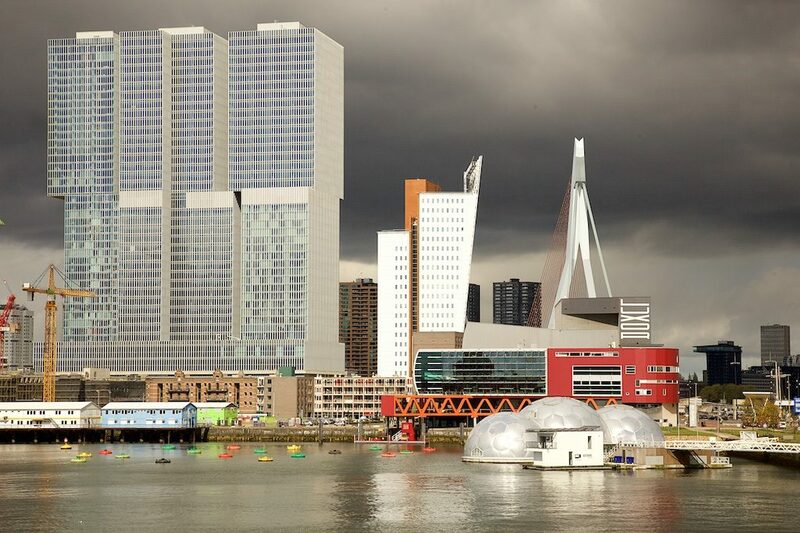 Rotterdam is known for being addicted to the idea of progress, and thus is an ideal place for a biennale on the future of cities. 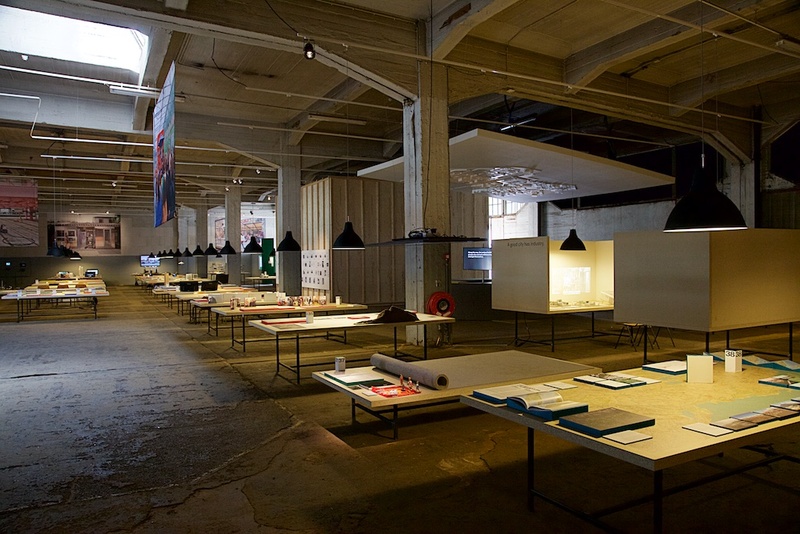 The seventh edition of International Architecture Biennale Rotterdam runs until July 10th, aiming to energize citizens and provide ideas for vibrant urban economies. 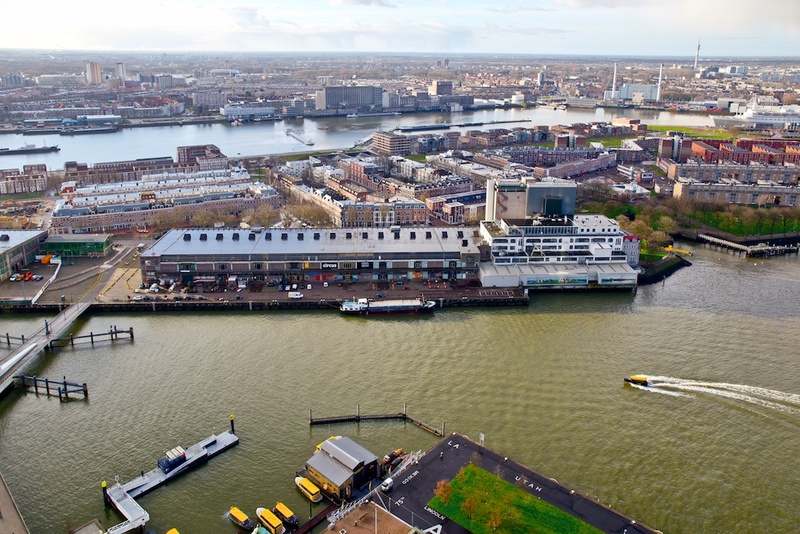 This year the Biennale is held at the Fenixloods warehouse on the Katendrecht quayside, behind OMA’s De Rotterdam skyscraper and opposite the New York Hotel. The Katendrecht district resonates with the biennale theme ‘The Next Economy’, the divisions between big corporations and citizens, market forces and active individuals. The warehouse, also a hugely popular local foodie destination, has recently been targeted by plans for high-end housing to be built above it. Led by Maarten Hajer as chief curator, the exhibitions explore and expand the political boundaries in urban culture. Hajer, who is not an architect but a political scientist, raises questions about the urban tech revolution and concepts such as the ‘smart city’, of which the driverless car has become the ultimate symbol. Yet the purpose of the ‘smart city’ remains unclear — what does it actually deliver and for whom? Compared to the Venice Architecture Biennale, the Rotterdam exhibitions are much more grounded in reality — not just showcasing the excellence in design, but focusing on solutions for everyday life. As Hajer points out, the Biennale has always been based on a research theme that aims to unravel current urban issues. This year over fifty international projects have been selected, covering recycling, health care, manufacturing, self-build initiatives, and even dating. Freek Persyn and Michiel van Iersel from the curatorial team are particularly excited about projects in Africa, where clean energy is already a significant resource, showcased here in the vast solar farm project in Morocco. Yet in northern countries there is clearly more friction over the best strategy for powering the planet. For example, the construction of wind farms in the North Sea has stalled. “It’s a battle about what the future holds for us,” van Iersel says, “is wind a good solution or should we use geothermal heath and go under ground?” The exhibition offers many often contradictory solutions to these questions. But as Persyn states, the aim of the programme is to encourage dialogue. Projects created by individuals can be crucial for cities where basic services are not properly organised by the state. As an example, van Iersel mentions the waste collection and recycling system Wecyclers launched by Bilikiss Adebiyi in Lagos. It is now a successful business, offering work to locals, helping with the city’s massive waste problem and putting recycled materials back into use for local manufacturers. “I find that very inspiring – I would like to do that!” says van Iersel. 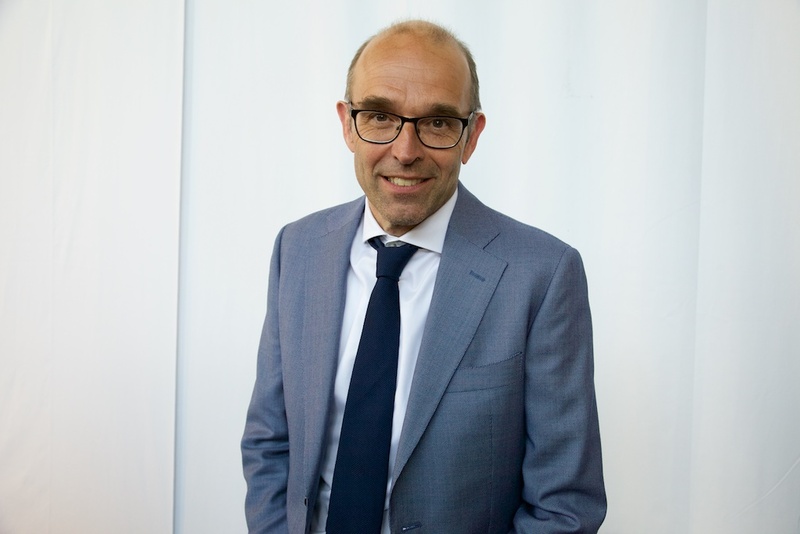 Getting big corporations involved with grass roots activities is a model where Maarten Hajer sees great potential for the future. Hajer does not believe in state-led projects, instead his concept ‘the energetic society’ is based on a community where collaborations can be developed on all levels – an entrepreneurial spirit that breaks boundaries and explores new possibilities. In some of the smallest projects at the Biennale, Hajer finds imaginative alternative solutions for cities. These projects provide inspiration, while also questioning the state’s role. 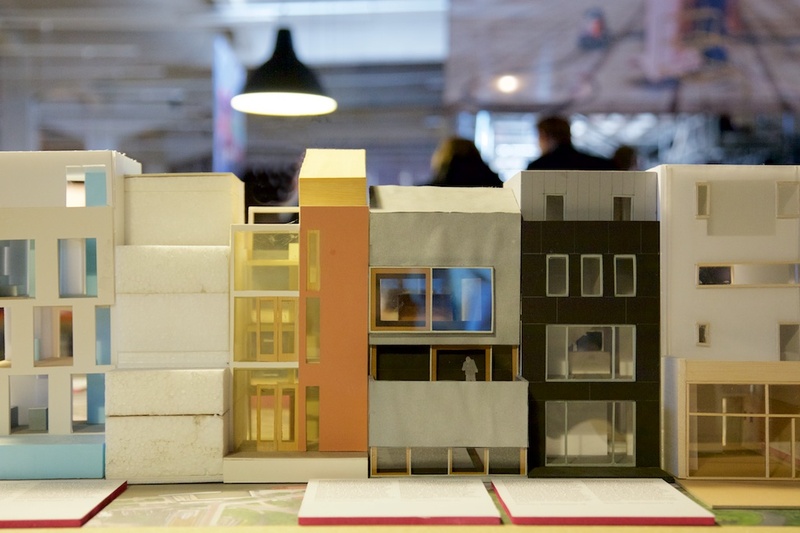 The Katendrecht area’s famous Walhallalaan row of houses, a few blocks from Fenixloods, is showcased as a model for a self-build initiative. It must be one of the most remarkable urban compositions of terraced houses anywhere. Built by architects as work-live spaces for their families, the houses demonstrate a progressive aesthetic flair in Dutch city planning and a great inspiration for flexible and imaginative urbanism. On the other hand they are symbols of gentrification, for which there seem to be rising concern. 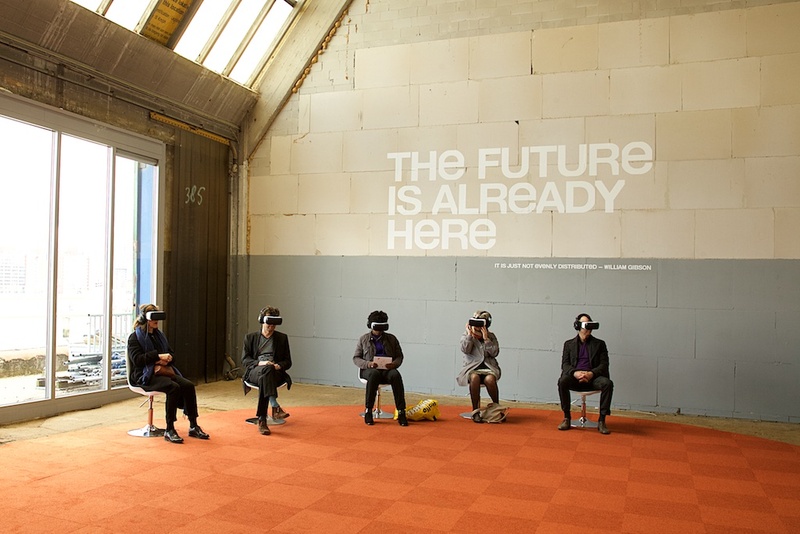 The virtual reality presentation by the entrance uses game technology to take visitors on a journey into the future, showing how mundane issues in health care for the elderly and mass transportation might be dealt with. In today’s context however, it might be more realistic to think that the older generation would have the spare room to offer, rather than the other way round, at least in cities like London. There is a sense of pragmatism throughout the exhibitions and the talks, supported by creative ideas to delight and encourage new paradigms for city living. In parallel to the Biennale, at the Tent Gallery the ‘Utopian Dreams’ exhibition showcases unrealised urban projects, including contributions from Rem Koolhaas, Claes Oldenburg and Wim Gijzen, highlighting the provocative play with forms and ideas in Dutch design and culture. “Sometimes low tech may be better,” Hajer says. He sees great potential in a dialectical relationship between high tech industries, the grass roots initiatives and small individual projects, in the hope that each one can inspire one another. Whether the current nostalgia for more simple lifestyles will go as far as bringing farm animals back to the city remains to be seen, as in artist Wim Gijzen utopian dream from 1969 of cows grazing in the centre of Rotterdam. Perhaps we might actually prefer horses doing deliveries rather than drones?